Alliums – Discover The Missing Link! | Faddegon's Nursery, Inc.
Alliums – Discover The Missing Link! Aug 23, 2017 | Bulbs, Garden Tips, What's New? Imagine a beautiful late spring day. As your tulips and daffodils are beginning to fade, you are now waiting for summer perennials to bloom and for annuals to really take off. If you want something to fill in that garden gap, it’s time to meet alliums! These onions won’t make you cry or hold your nose! Just the opposite. Ornamental alliums, members of the onion family, share much in common with garlic, leeks, and chives but where they stand out is their ability to put your garden into high gear. Not only are their globe shaped flowers impressive but they begin blooming at just the right time in late spring and early summer. Whether you choose the tallest, the ones with the biggest flowers, or the most unusual, you’ll be inspired by what you’ve discovered. Planted in the fall, allium bulbs are super hardy and when in bloom are critter resistant! They look awesome in combination with other flowers that will hide allium foliage when they begin to fade. What more could you ask for? Pollinators adore them and so will you! Very tall! Multiplies nicely. Color is lilac or lavender purple. Try planting with Camassia! Very long blooming! Huge flowers. Color is a vibrant purple. Great with poppies! Bloom time: Late spring, early summer. Blooms a little later than Gladiator. The tallest! The pinkish-lavender flowers tower above anything in the garden in early summer! Try planting with early blooming iris or ornamental grasses. Has a soft fragrance. Flowers are a beautiful pinkish violet color. Nice with a blue salvia. 4-6″ flowers. Not completely spherical, the bottom of the flower is flat. 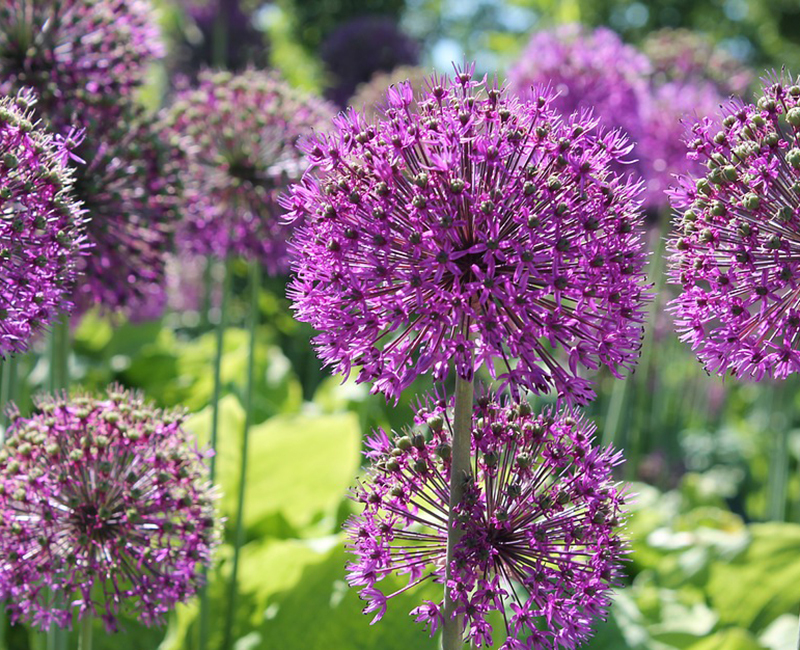 Many people consider this to be their favorite big flowered allium because of the unusual color, a metallic fuchsia. Lovely with yellow dianthus. The very pure white of Mount Everest makes it a natural for perennial pairings. Let Rozanne geraniums bloom around them. Bloom time: One of the earlier alliums. Blooms late spring before most others. Just so different because of the beautiful flax blue flowers. Plant around Stella d’Oro daylilies. The unusual egg-shaped flowers look good with any perennial. What it lacks in height, it makes up for in pizzazz! Each flower is a rosy explosion! The sweetest among low groundcovers. Lovely flowers different from any others. Colors are yellow, pink, and white.